The key to understanding the reasons for this can be found in the words of Alexander Solzhenitsyn: “And no sooner will falsehood be dispersed than the nakedness of violence will be revealed in all its ugliness ‐ and violence, decrepit, will fall.” Freedom Nyamubaya provides an example of how this can be done in our world. Her personal example and poetry speak truth to us and they do it fearlessly. They unmask violence and enable freedom and peace to grow. Indeed, her last public words were: “Freedom is what we miss.”  She showed people how to gain freedom not just externally, but also on an internal, personal level. When I look around, I see too many of us who live in democratic societies, enjoy the rule of law, have job opportunities and benefit from social services, but who are not internally free. In other words, too many of us have lost the ability to be totally true to ourselves; we have lost our way by trying to become successful careerists; we have lost ourselves in dysfunctional relationships of our own making; and we have lost ourselves in consumerism and the inevitable distractions of luxury. Freedom Nyamubaya, in contrast, continues to ask us a very direct and personal question: “Are you free? Are you being true to yourself? Are you being “one good piece of music”? For mediators to “bring peace into the room” more is required than learning skills and understanding how the mediation process works. They need to ask themselves some tough personal questions – much like the one which Freedom poses to us. The internal work for inner peace, freedom and truth does not need to happen before the external work for peace and justice. The two can go hand in hand. What is vital, however, is that one should not forget the inner work in the midst of external activism. Here too, Freedom is a source of inspiration. Besides struggling for the liberation of her country, Freedom Nyamubaya also fought every inch of the way for her own personal freedom and inner peace – economically, politically, psychologically and spiritually. She experienced violence but refused to become a victim. She was not born free, but became free. 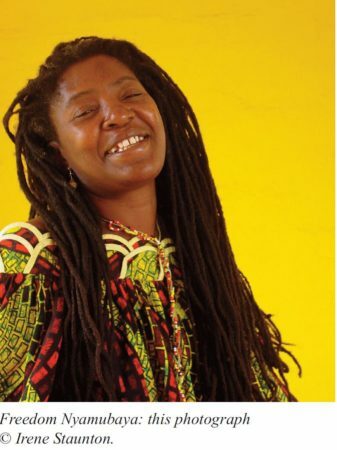 By seeing her life and listening to her poetry, the realization dawns: “If she became free under such difficult situations, there is hope that I can also become free.” Her life and words help us liberate ourselves; this is why she continues to resonate far beyond Zimbabwe. By dancing, writing poetry, laughing, mediating and speaking the truth.